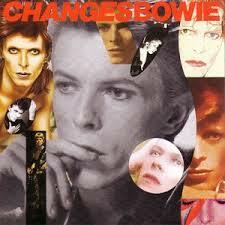 Changesbowie, released in 1990, is an attempt to cram a twenty-something year career onto one eighteen-track CD. To give you an idea of the challenge, in that time Bowie released seventeen studio solo albums. For some of them he (or his record label) employed competent people to do the cover art; for this one, they apparently got the intern to knock out something on a Friday afternoon. Let’s assume that, if you live in the Western world and don’t hate music, you’ll be at least passingly familiar with David Bowie. If you’re buying this album then you probably want a little bit of Bowie in your life, but really can’t be faffed with all those seventeen (now up to twenty-five) albums. You want a nice slice of curated pop, showcasing the weird and the genius while skipping all the bits that were just a little too weird. And to some extent, I’d say this delivers. It starts, of course, with 1969’s Space Oddity, takes in the biggies of the early 70s, skips pretty lightly over the Berlin years, catches up with the pop hedonism of the beginning of the 80s, and then is (wisely) silent on the end of the decade. Of course, with any compilation like this the question rapidly becomes not “what’s on it?” but “what got left off?” leaving us to wonder exactly who thought that rather turgid Fame was more worthy of inclusion that the excellent Life on Mars or Starman. To be fair, both of those made it onto the slightly-longer LP/cassette versions. Why didn’t they miss off the rather soupy Golden Years in favour of Ziggy Stardust’s overblown Rock and Roll Suicide? But at the point you’re asking those questions, maybe it’s time to move on and buy a couple of albums. This is certainly a decent snapshot, and covers Bowie’s development through musical styles over a couple of decades. It also gives the impression of being a carefully-compiled list (and not, in fact, a rushed-out record-label cash-in brought on by Bowie’s decision to go off and produce completely different music with Tin Machine at the time). If you’re an absolute beginner, it’s not a bad place to start.